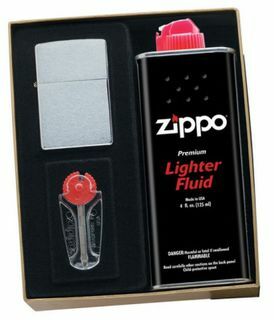 Zippo lighter gift pack containing a Black Ice #150 fluid lighter, a can of naptha refill fluid and a pack of 6 replacement flints. Presented in a tasteful black, boxed gift set. 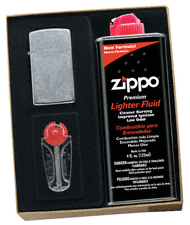 Zippo lighter gift pack containing a Black Matte #218 fluid lighter, a can of naptha refill fluid and a pack of 6 replacement flints. Zippo lighter gift pack containing a Brushed Brass #204 fluid lighter, a can of naptha refill fluid and a pack of 6 replacement flints. 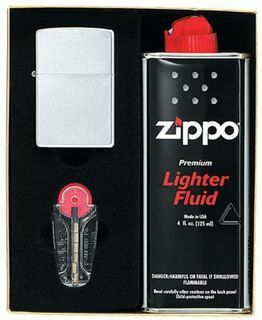 Zippo lighter gift pack containing a Brushed Chrome #200 fluid lighter, a can of naptha refill fluid and a pack of 6 replacement flints. 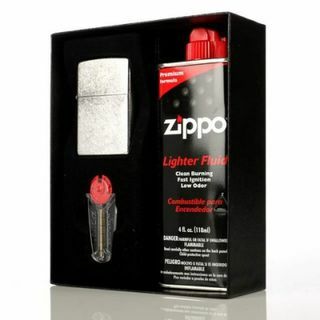 Zippo lighter gift pack containing a Polished Chrome #250 fluid lighter, a can of naptha refill fluid and a pack of 6 replacement flints. 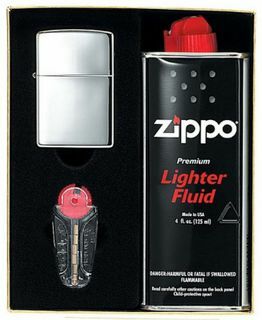 Zippo lighter gift pack containing a Satin Chrome #205 fluid lighter, a can of naptha refill fluid and a pack of 6 replacement flints. Zippo lighter gift pack containing a Street Chrome #207 fluid lighter, a can of naptha refill fluid and a pack of 6 replacement flints. 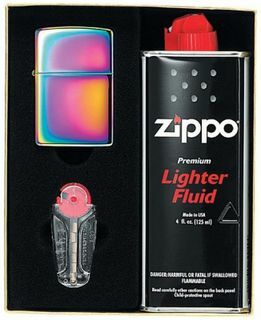 Zippo lighter gift pack containing a Spectrum #151 fluid lighter, a can of naptha refill fluid and a pack of 6 replacement flints. Zippo lighter gift pack containing a Hidden Dragon #21067 fluid lighter, a can of naptha refill fluid and a pack of 6 replacement flints. 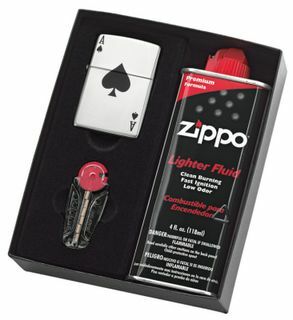 Zippo lighter gift pack containing a Lucky Ace #24011 fluid lighter, a can of naptha refill fluid and a pack of 6 replacement flints. 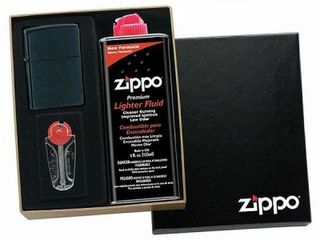 A presentation pack with space for a regular size Zippo lighter but containing a Zippo liquid naptha refill can and a pack of Zippo flints. 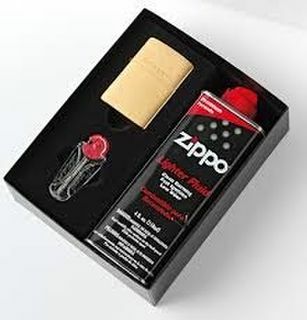 Note: this pack provides the space for a Zippo regular lighter which you must purchase separately. A presentation pack of space for a slim size Zippo lighter but containing a Zippo liquid naptha refill can and a pack of Zippo flints. Note: this pack provides the space for a Zippo slim lighter which you must purchase separately. 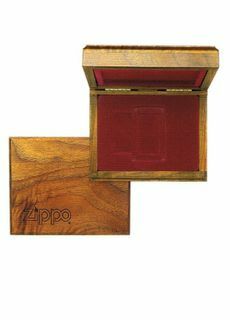 Zippo wooden display box with logo, red velvet interior and space for one regular zippo for a very special gift for that very special person. Made in the USA from American walnut. 130mm long X 90mm wide X 40mm high.